IMPERIAL BEACH, Calif. (KGTV) - For an Imperial Beach man, the burglary wasn't just violating. It was life-threatening. Along Cypress Avenue on Friday, Maurice Epley, 59, and his daughter wrapped up a week-long move-out from their apartment. His daughter and her husband were the last to leave, around 8:30 p.m. Maurice returned the next morning. He discovered a handful of items yet to be moved were missing, including a bike, a guitar and his sleep apnea machine. Diagnosed with series of ailments, including emphysema and an enlarged heart, doctors say Epley actually stops breathing several hundred times every night. For more than four years, he's used the sleep apnea machine - paid for through insurance - which uses pressurized air to maintain air flow. 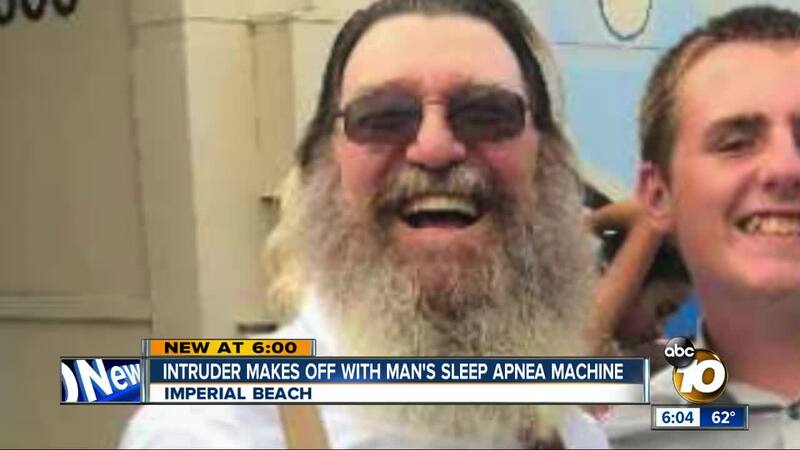 "Without machine, I'll be laying in bed and completely stop breathing for a minute or even longer," said Epley. Since the break-in, he routinely wakes up gasping for air. He's in the process of contacting his doctors to see if his insurance will pay for another device. The thief left behind a white shirt with the words 'West Coast Classic' and a dark cap with a marijuana leaf printed on it. A neighbor spotted a man in his 20s wearing those items, skateboarding near the home Friday evening. Anyone with information is asked to call the Imperial Beach sheriff's station at 619-498-2400.